Where in the world are you this Wednesday? Whether you’ve traveled the globe or have merely gotten lost in a book, I’d love to read about the places you go! Have you documented your kids riding a camel in Egypt or clinging to a carousel horse at the mall? Whether you’ve traveled the country or stepped out to your own backyard, share with us: Where in the world are you? 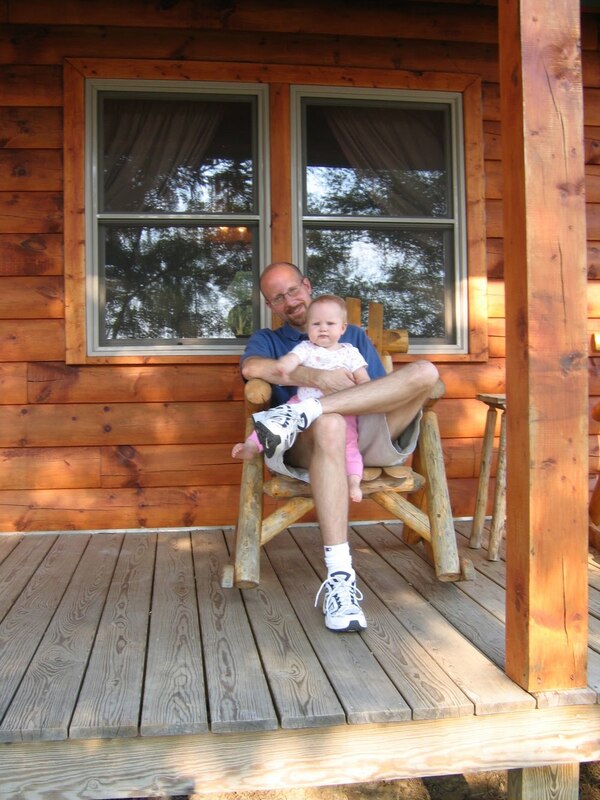 Ed is at work today, but I know this is where he wishes he could be: on a porch at a log cabin in a rocking chair with his baby! I took this picture during our trip to Southern Illinois in 2005. 4 Responses to Where in the World? I too wish I was at a cabin with my babies! My Where in the World post is still sitting in draft form on my computer, but I guess it's an early start for next week, right!! That's a great question! I'm lost in Sweden via The Girl With The Dragon Tattoo. Sweet photo. In a few weeks I will be sitting on a cabin porch in the woods! It's the best.